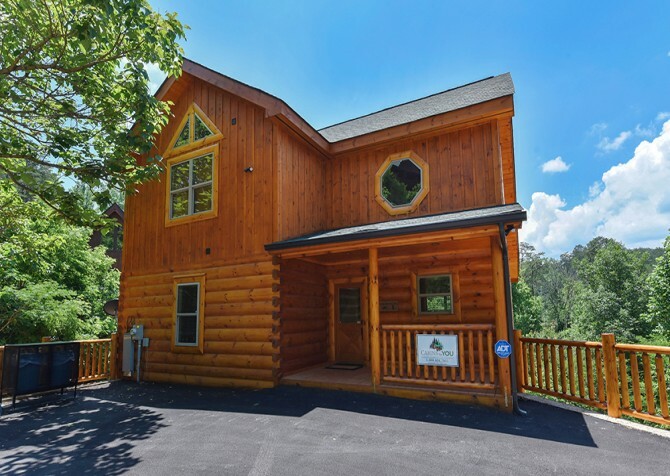 Slip away for fun and relaxation at Easy Livin’, a 1-bedroom + loft, 2-bathroom cabin for 6 just minutes from all the excitement of downtown Pigeon Forge! 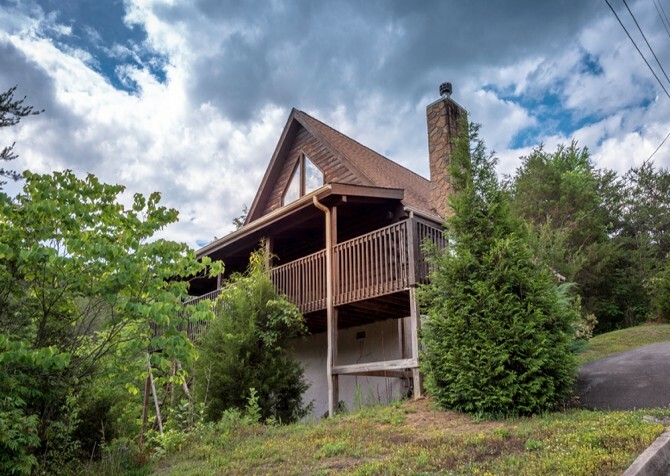 This rustic retreat is a Smoky Mountain gem, with the atmosphere of a quiet mountain escape and the amenities of home. 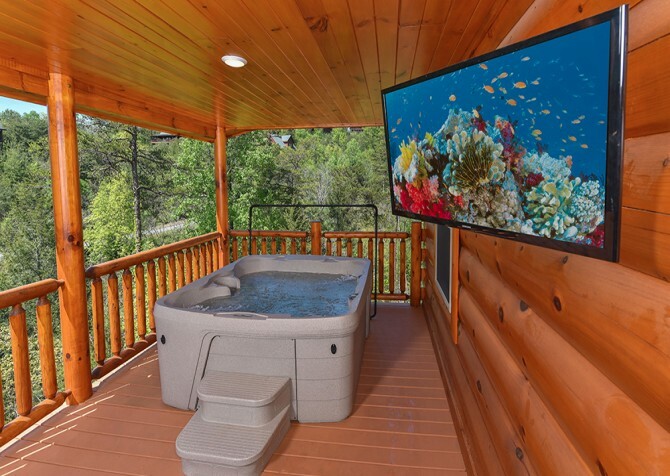 Unwind from your travels in the outdoor hot tub with serene woodsy views, shoot a few rounds of pool with friends, host a barbecue party with the gas grill, take a spa bath in the jetted tub, and snuggle with your spouse on the queen-size bed. From games and movies to quiet nights by the fire and in-cabin meals, it’s a cozy cabin fit for fun family vacations, weekends with friends, and romantic escapes. When you’re not exploring the attractions, restaurants, and shops downtown, make yourself at home at Easy Livin’. On cool mountain nights, unwind in front of the wood-burning fireplace with a cup of hot cocoa in the drink holder, a good book in your lap, and your feet propped up on the built-in footrest of the love seat. Or plop on the sofa, grab a comfy throw pillow, flip on the big screen TV with Blu-ray player, and check out the DVDs in the cabin for a fun movie night! You may even sneak in an afternoon nap or two in the plush recliner here — with the peace of the mountains and cool of the ceiling fan, what could be better? 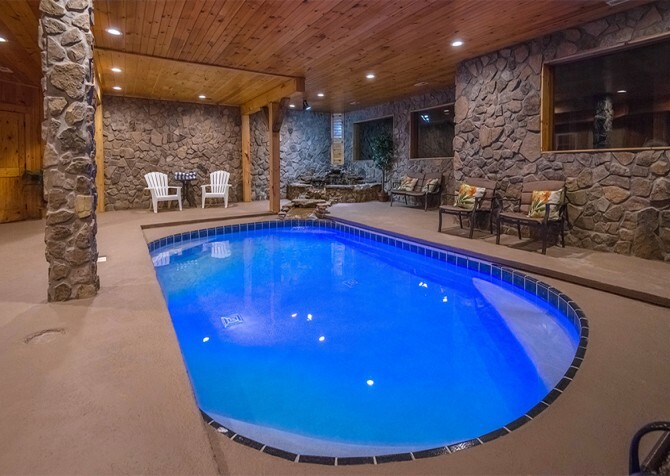 Perhaps rousing rounds of pool just around the corner at the awesome pool table! With an open concept throughout the home, the fully equipped kitchen keeps seconds within reach, popcorn refills mere steps away, and conversations going without the need for a pause. Grab fresh ingredients from the refrigerator, whip up breakfast, lunch, and dinner on the stove, and let the dishwasher clean up the mess. Plus, you’ll find everything you need — from silverware, cookware, and dishes to a coffeemaker, mixer, and toaster — so your favorite recipes can be brought to life on your Smoky Mountain vacation. And if you’re more interested in downtown restaurants or delivery options, the kitchen is ready and willing to store and reheat at a moment’s notice! Worried about spilling a dish or a drink on your way to the table? Well, with the dining space in the heart of the kitchen, that won’t be an issue at Easy Livin’. Feel free to leave the main course on the stove and sort the sides on the dining table with ease. Complete with 4 cushioned chairs, the round dining table is not only great for mealtimes but also handy for game night. Simply grab a board game from the living space, set everything up, toss out the rules, and enjoy quality time with family and friends! After the winner declares victory and everyone’s all tuckered out, head to the indoor jetted tub in the loft for a soothing bubble bath with lavender-scented candles and calming music. Once your muscles are relaxed, put on your favorite pajamas and hop in the bedroom’s queen-size bed with a canopy, the loft’s cozy full-size bed, or the extra queen sleeper sofa in the living room. Too excited to sleep? Switch on the flatscreen TV for a comedy show, classic drama, or action flick as you drift away to dreamland. 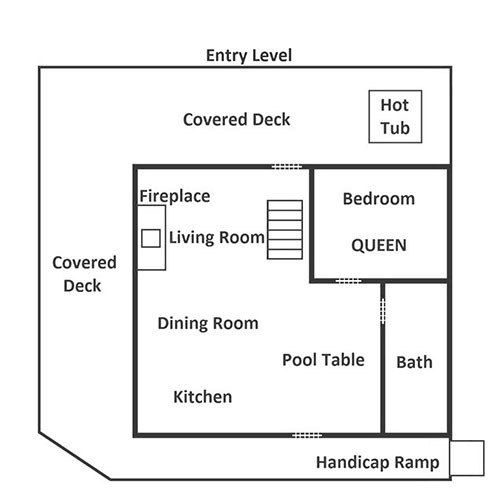 Outside, enjoy wooded views and fresh mountain air from the covered wraparound deck at the semi-private Easy Livin’! Sit back in the porch swing, sip local moonshine from the rocking chairs, fire up the gas grill for a cookout at the picnic table, or climb into the hot tub for a soothing soak after a long day. With the sights, sounds, and smells of the mountains all around, you’ll feel tucked away in your own little paradise. 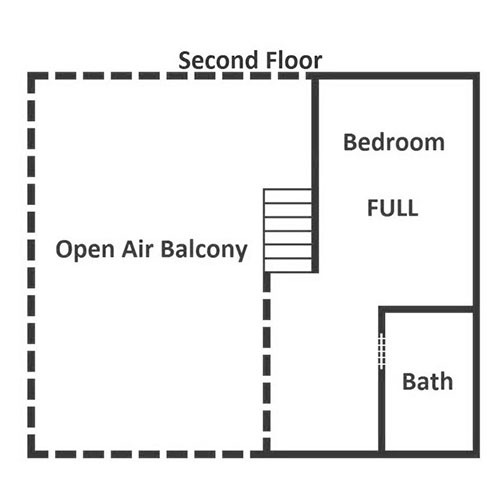 As a bonus, the parking area for 2 is paved and there’s a ramp leading to the front door, so you and your guests can unpack, load, and travel to and from town effortlessly. But wait — there’s more! After all, it wouldn’t be Easy Livin’ without wireless internet for browsing local deals online and a washer and dryer to keep clothes and towels fresh on your return home. Only 4 miles from the hustle and bustle of Pigeon Forge, Easy Livin’ keeps you nestled in the Smoky Mountain forest without tearing you too far from city restaurants, local attractions, and shopping centers. Ride alone or with a friend at the speed of your choice — up to 27 miles per hour — through the trees and round the mountain on the Smoky Mountain Alpine Coaster. Family-owned and -operated since 1998, Yesterday’s Antiques presents unique keepsakes, beautiful mementos, and classic décor you just can’t pass up. History tickle your fancy? Visit the Alcatraz East Museum, harboring authentic pieces from mind-boggling crimes all over the country. We're patiently waiting to hear feedback from our guests on this cabin!